The Capricorn man is often the respected chef, CEO or high-power figure in any company. This astrological sign is known for being single-minded and ambitious. Once he decides that he wants something, he will pursue in a determined, steadfast way. Even if there are horrendous obstacles and pitfalls along the way, he will ultimately get what he wants. Unlike some zodiac signs, the Capricorn man is entirely realistic. He might have an over-the-top goal in mind, but he does not base that goal in a fantasy world. He is practical and realistic in achieving his dreams. He would much rather take concrete actions to achieve his goals than daydream about achieving it. This is the type of guy who can accomplish great things in his life. At first, a Capricorn man in love may seem reserved or even shy. He is not the type of guy who rushes into any personal or business relationship. His romantic relationships are a long-term investment. He will fall for someone quickly after starting the relationship, but he will not start a relationship unless he thinks that the partner has long-term potential. Before he ever makes a move, the Capricorn man will assess you carefully. He wants someone ho has similar interests and likes the same things as he does. You need to have a distinct personality and drive to get his attention. The Capricorn man will never fall in love with someone who is just a pretty face. He wants a woman who will commit as deeply to the relationship as he does and who is willing to go the extra mile to make things work. He is never interested in a woman who plays games or tries to manipulate him. Instead, he wants to find a woman who is mature and willing to work on problems to make the relationship work out. Being in a relationship is easy. The hard part is finding the right mate. The Capricorn man will sit back and watch his options for awhile. He will notice what you like and dislike. He will mentally jot down key parts of your personality and what you want out of life to make sure that you will actually be worth his time. He needs a perfect match if he wants to stick around. While he certainly wants to find the perfect woman, he is also unwilling to settle for less in the short run. He is generally not a player or interested in one night stands. If you aren’t worth a long-term relationship, he is not going to be interested in having you around for just a night either. He wants a woman who is more than just looks. He needs to get to know you before he ever starts a relationship. Because of this, many Capricorn partners will be friends with a woman before they ever date her. He has to decide if you are worth the investment just like he decides if a business investment is worth his time. Once you start dating a Capricorn man in love, you might think that he is aloof or standoffish at first. This is not because he is not interested or emotionally intrigued. He is just afraid of showing his feelings at first because he does not want to ruin your future together. When he is really into anyone, he will carefully unfold his emotions so that he does not scare his date away. Once you have moved past the initial stage of the relationship, he will start to show the other sides of his personality. He will be loving and affectionate. If you need something, he will do anything to make sure that you stay with him. Basically, the average Capricorn is interested in a long-term relationship. If he has found the perfect mate, he will put his all into the relationship and do anything to keep her. With his love of being in charge and managing business, he expects to be the man of the house. At the same time, he wants his partner to be secure and talented. He won’t want you to be better than him, but you need to be almost as good and interested in the same things. One common problem with the Capricorn man is his stubbornness. Over time, he gets extremely set in his ways. He is the type of person who plans out the steps to his goals and figures out the most efficient way of doing this. Because of this, he is stubborn when you want him to change his mind. He is certain that he already found the best way, so it is hard for him to think that any other technique could work as well. Another common issue with the Capricorn is his pessimism. He is a hard worker and exceptionally good at the things he cares about. While he is an overachiever, he will always think that he is not good enough. He has high expectations for himself, and it is hard for him to ever live up to his own goals. Because of this, he tends to have a negative, pessimistic mindset about himself and life in general. The last issue you may encounter is his shyness. As we mentioned before, the Capricorn man is only dating you because he is certain that you would be a good match. He does not want to show his confidence and come on too strong because he thinks that he may scare you away. He may even seem uninterested because he is shyly hiding his cards until the relationship has progressed. If you think that he is shy at first, wait a while and get to know him better. 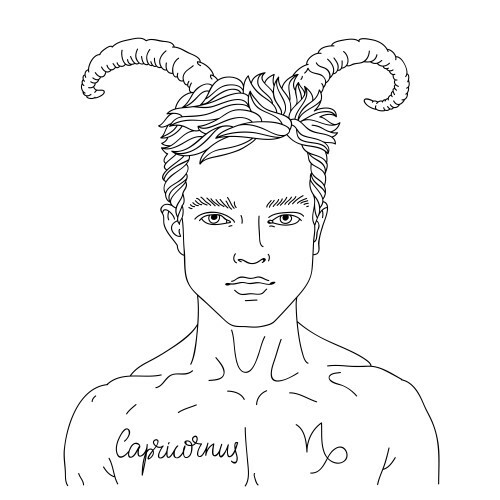 Before long, you will see your Capricorn blossom and start to show his true colors. He is dedicated, hard working and ambitious. Those qualities generally make people think that the Capricorn man is not exciting in the bedroom. In reality, he is decidedly not boring in bed. He might lack imagination in his working life, but he makes up for it with his desire to please his partner. His goal is to find one or two things that really please you. Once he knows what you like, he will strive to perfect his skills until you are completely satisfied. He might not be boring, but he is generally not that adventurous either. If you want your Capricorn man in love to be more adventurous in bed, you have to tell him what you want. His number one goal is to please you, so he will try new things if he knows that you want him to. He will treat you like his queen in the bedroom and never expect anything in return. Because of this, the Capricorn man can be an extremely enjoyable partner in bed. If you are into whipped cream or restraints, you just have to tell him. He might not be interested in those things himself, but he will certainly try them out if he thinks that they might make you a little more satisfied in the bedroom. I keep reading that Cappys take a while to watch potential partners. How long though? Days? Weeks? Months? Years? Each person is different than another. Some people may choose to be more or less patient. Treat each individual with kindness and compassion at all times. Have a great day, Dawn!